We are invited to join this cruise, which will take us on a magnificent journey through the Saône-et-Loire and La Côte d'Or regions of France. We cruise gently past the banks of the River Saône, this “sacred water” with its preserved nature and discover all the attractions of the Canal du Centre, “the canal of the two seas”, linking the River Saône to the River Loire. Then we pass through hills and lush green pastures, invigorating forests and countryside, discovering the canal de Bourgogne and its wonderful rural landscapes. At the crossroads of the great wine appellations, we cruise alongside the great vineyards of the Côte Chalonnaise and the Côte de Beaune. This is a discovery tour of all the famous destinations; each town unique and authentic, so prepare to be captivated by its many facets. Boarding the MS JEANINE commences in Saint-Léger-sur-Dheune around 6.00pm. We are welcomed on board and introduced to the crew before we have dinner on board. Overnight stop. After breakfast on board, we set off by coach for a walk to the Cirque du Bout du Monde, a natural site for Natura 2000, so we can see for ourselves the imposing chalk cliffs carved out by the river Cozanne which create a cirque where a 25m high waterfall was formed. We return to Nolay on foot and join our coach to set off for Mont de Sène, or the Mountain of the Three Crosses, an ancient Celtic religious site which overlooks the Santenay vineyards from a height of some 521m. Classified as a “nature park”, it is characterised by its rustic plants and wild shrubs. From this spot there are amazing panoramic views of the surrounding main peaks and valleys, including the vineyards of the Côte de Beaune, the Saône Valley, Morvan, Jura and the Alps. This afternoon we set off to visit the chateau at Rully(or a medieval fortress situated in the heart of a vineyard and belonging to the same family since its construction). Next we continue our visit with a wine tasting, the perfect opportunity for us to sample a little of what life in the chateau could be like. We return on board in Chagny. Dinner on board and we moor for the night. Buffet breakfast and lunch on board today as we spend the morning afloat, cruising towards Chalon-sur-Saone. We can also cycle along the banks of the River Doubs by taking the green Route (1). This afternoon, we have the chance to explore Chalon-sur-Saone, birthplace of Joseph Nicéphore Niepce, who invented photography in 1824. We have an excursion round the old town with its wooden framed houses constructed during the 15th to 17th centuries, the Cathedral of St Vincent and classical dwellings from the 17th and 18th centuries. We continue our tour to the town centre and have a wine tasting of Cote Chalonnaise wines. We return on board for dinner and moor for the night. We take breakfast on board and spend the morning afloat, cruising towards Saint-Jean-de-Losne. We can also use the bicycles available on board to go for a cycle ride along the Green Route (1). We have lunch on board. The afternoon is spent on a guided visit of Saint-Jean-de-Losne. We set off to discover the monuments that bear witness to a prestigious past such as the Monument Commemorating the Siege of 1636, the Hotel-Dieu which was a hospital founded in 1658 surrounded by wrought iron railings dating from the 12th and 13th centuries. We also discover the Gare d'Eau (or Water Station) and visit the Gothic-style Church of St John the Baptist, brick-built during the 16th century, and the Batellerie Museum (also known as the Sailors' House) (closed on Mondays), one of the oldest houses in the town, dating from the 15th century which recounts the history of navigation. Our visit ends at the Hotel de Ville where we have the chance to taste some specialities from Burgundy. We return on board for dinner. We moor for the night. Breakfast and lunch on board today as we spend the entire day afloat, cruising towards Petit-Ouges. We can also use the bicycles available on board to go for a cycle ride along the Green Route(1), alongside the MS Jeanine. At each lock we pass through, you can get off the boat and visit the charming villages on foot that line the Doubs. We arrive around 7.00pm in Petit-Ouges and dinner is on board. We moor for the night. After breakfast, we have a full day's excursion to Dijon and the Grands Crus Wine Route (lunch included). The day begins with a tour along the Grands Crus wine route, including Gevrey-Chambertin and the Clos de Vougeot, where we visit the château. Next we head for Citeaux Abbey where we visit the famous abbey, birthplace of the cistercian monastic order and still inhabited by monks today. Finally, we have a winetasting at the chateau at Marsannay (or similar). We have lunch in a local restaurant, after which the afternoon is spent on a guided visit of Dijon, the historic capital of Burgundy. The historic centre, with its many ancient houses, “bourgeois” homes and parliamentary buildings, occupies several hectares of what is known as a Protected Area (to preserve the ancient monuments and buildings for posterity). 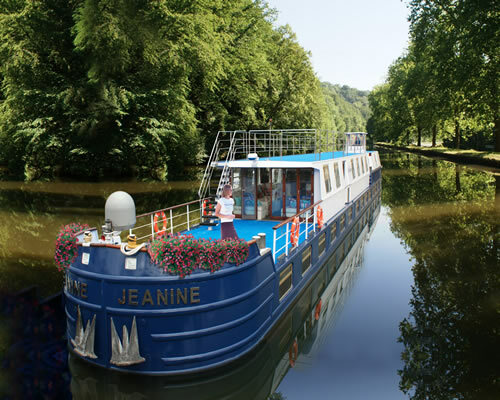 During our excursion, the MS Jeanine has cruised to Dijon, where we rejoin her. Tonight is our Gala Dinner and Evening on board. We moor for the night. Breakfast on board. We disembark at 9.00am. End of our journey. Rate includes: 6 night cruise, all meals, wine with meals, drinks from the bar and excurisons. Bicycles available for cycling.